These fine fragrances for women are like a scented love letter to Michael Bublé's female fans. "By Invitation" works well for the daytime: it's inviting but not over-the-top. "Rose Gold" is similar, but softer and more sensual. Since my skin doesn't react well with distinct floral notes, these two perfumes are perfect. Highly recommend either one. LOVE both! I've loved By Invitation since it was launched on HSN. When it was not available I had to turn to other retailers to purchase it for a higher price...that's how much I love this delightful aroma. So happy it's back! I bought the new Rose Gold & am in love with the rich, not over whelping, feminine aroma. Thank you Michael Bluble for a fragrance that can be worn year round, day & night. 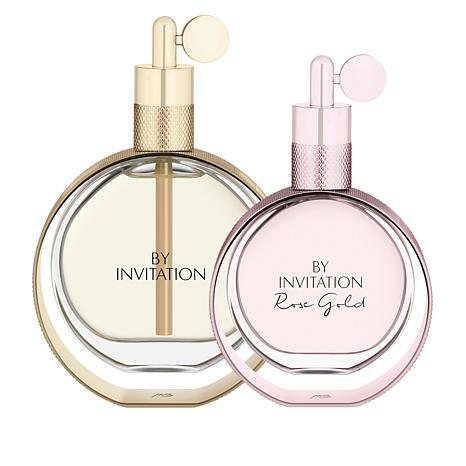 The two together were a great deal and the Rose Gold is a nice subtle yet great smelling perfume (my favorite of the 2). I am a perfume addict and these are a great addition to my collection. The Invitation is a little more of a Classic perfume smell and a little stronger but still smells good and a little goes a long way. Remind me about Michael Bublé upcoming shows.